I love these photos my daughter took of grandgirl and scrappy buddy, Miss Grace, in her Halloween costume. Daughter, Cyndi, sewed the cape and Grace wore it proudly as she carried her basket trick or treating. 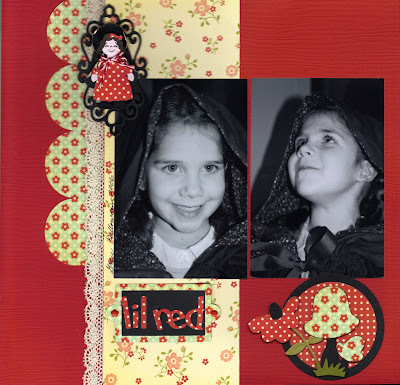 :) For this page I've use Mrs. Gnome as Red to mimic Gracie's costume. Her face is stamped using one of the ghost faces from the Peachy Keen Halloween collaboration release, and her basket is -- are you ready? -- a pumpkin from the pick-up truck accessories! Isn't she adorable! 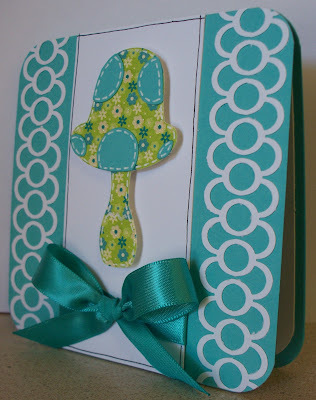 For this embellishment, I used the flowers and mushrooms die, also from the Gnome release. I thought they were perfect for the red riding hood theme. My favorite thing is cutting shapes from pattern papers. 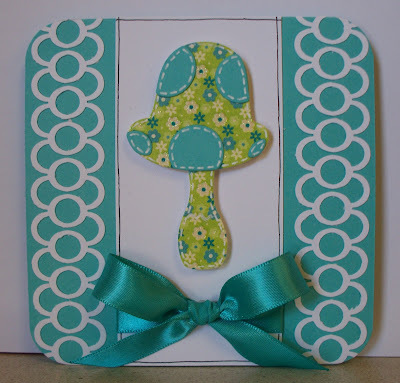 I love the whimsical look it gives them with an unexpected pattern or color. I hope you enjoyed my layout today. Scrapbook pages are my favorite and it's been too long since my last one. :) Have a great weekend. I hope spring has made its way to your part of the country! 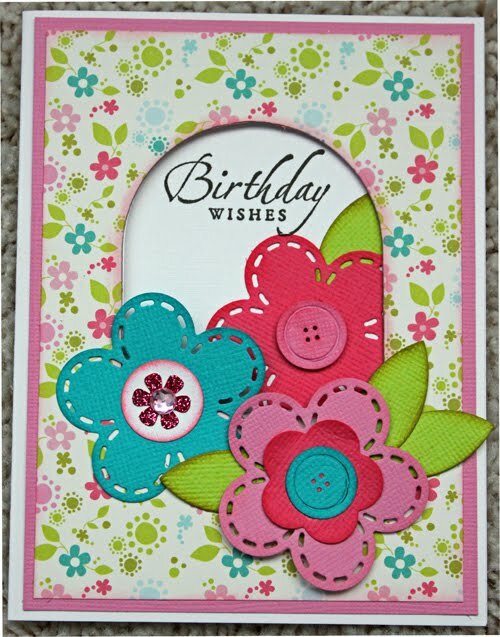 I finally got a chance to play with this Stitched Flower w/Button die. I love how they have these stitches around the flowers! 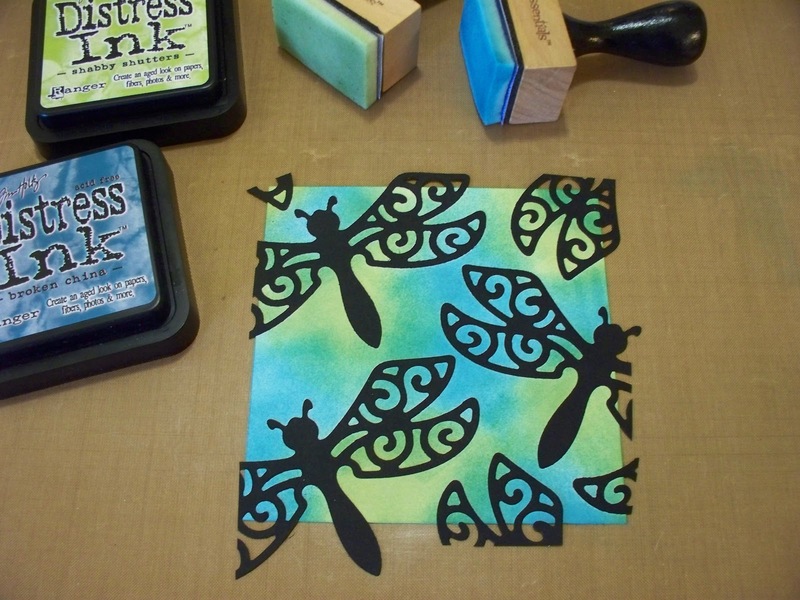 Of course there are many options with this die as CottageCutz dies are always giving you choices. A Birdhouse for all seasons. I was looking through my Cottage Cutz Spring Dies and I came across last years BIRDHOUSE Die. 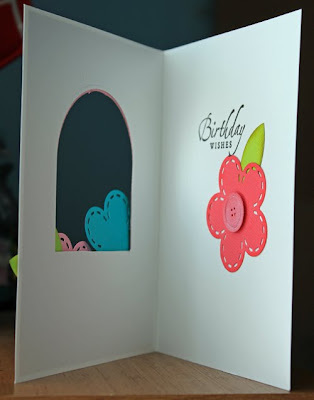 I had used it several times last year but mainly for Spring cards. As I stared at it I thought what about Halloween?, What about red birds?. The first picture shows the birdhouse basically as it was intended to look like, bright and cheer-y. The birdhouse next is a haunted birdhouse with a witch bird (green bird with witch hat). Wacky hanging shutters and spider webs. The bats were cut from the heart on the die, I just scalloped the bottom of the heart off. I used a lot of black and brown ink to shade pieces dark. The card I finished is a winter-y Valentine card. I used red birds with white flowers and heart. The cloud like shape is the Cottage Cuts Flower from the Stitched Flower with Button Die. I wanted the cloud to have the general shape of the mini flowers. . plus I needed a light color area for the verse. The branch with leaves are from the Cottage Cutz Blue Jay Die. This die has a lot of uses throughout the year. Red, White and Blue for a patriotic birdhouse. . Red & Cinnamon for a gingerbread house. . .on and on. Good morning friends! Here is a card I made with the Cottage Cutz Potted Flower. 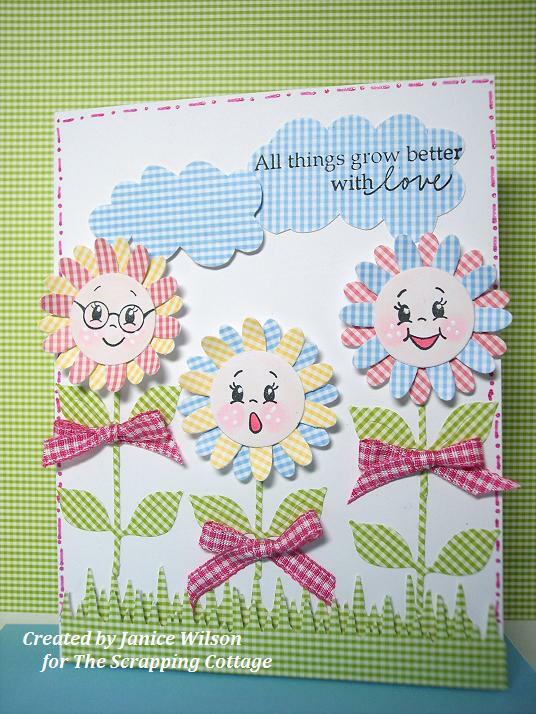 I used gingham cardstock to paper piece the flowers. I know I have said this before, but I will say it again. I LOVE me some gingham!Gingham and polka dots are some of my faves! 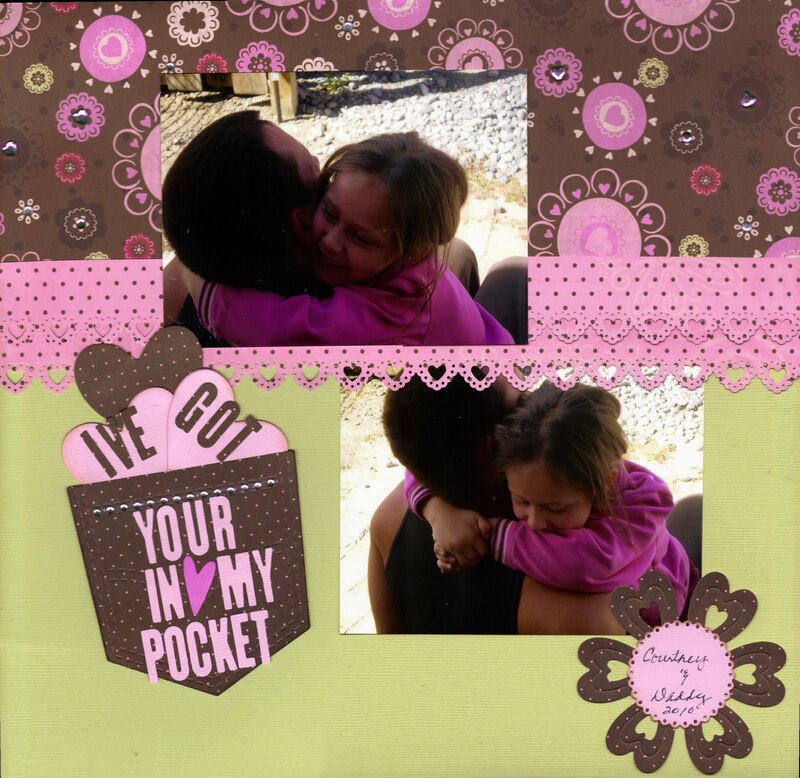 The sentiment is from Pink by Design, Life's a Garden. Happy Monday everyone! I will be back next Monday but I hope you will visit us everyday to see all the wonderful creations by the other designers. Hello! Here is a picture tutorial for you on how to create your own background paper with your die cuts and distress inks. Here I used the Ornate Dragonfly die. I cut my dragonflies out of Post It Craft paper which is adhesive backed and just perfect for this technique. 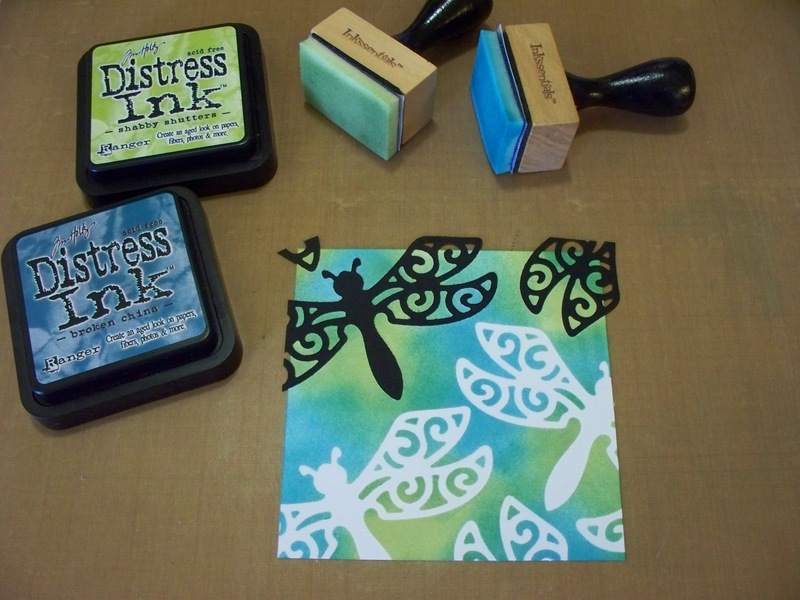 Ink up your sponge applicator tool and pounce the ink on. Do not swirl it on or you will lift up the "masks" you've stuck down. Ok, I hope you likey! :) See you back here next Sunday! 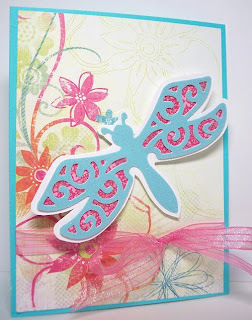 For this card, I used the new Filigree Fairy die from The Scrapping Cottage. I cut her out with some wonderful glitter paper, and I actually used my Copics to give her a little flesh color. Her dress was cut in pink glitter paper. I doubled up on the wings, and added some rhinestones, because even with the glitter paper, there still just wasn't enough bling for me! Is there such a thing as too much bling? I don't think so!! To gnome me is to love me! From the gnomes release, I've used the adorable Mr. Gnome and the older version mushrooms for this card. The sentiment is a digi stamp by Melonheadz Illustrating. Papers by My Mind's Eye, Quite Contrary line. A Carrot Delivery. . . Happy Spring. . .Mr. Bunny is ready for the season with a wagon of carrots. The Bunny is from last years Easter die from Cottage Cutz. Bunny with Overalls. I added a wagon with a piece of rectangle brown card stock, loop of brown rope and I used the Daisy layered with Button Die from this year to make the wheels on the wagon. I cut extra carrots from the Bunny die to fill the wagon. Well today is the first day of Spring. It sure doesn't feel like Spring here in MA. This certainly has been a long Winter. 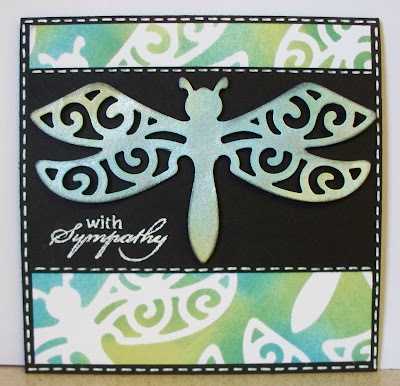 For todays card I used the Ornate Dragonfly die. 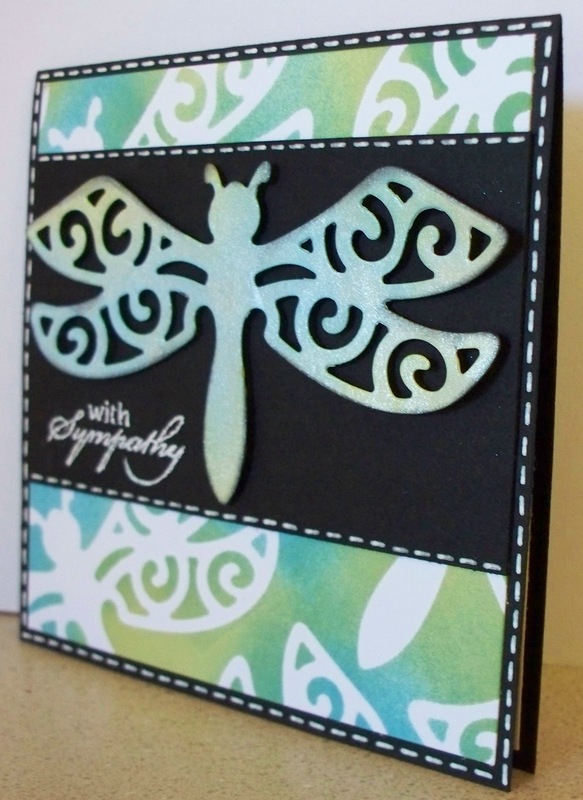 I used glittered cardstock from DCWV to make the dragonfly. I framed it with a white background so it would pop off the page. The background paper is from The Sasha Collection by Prima Marketing. The ribbon is from Michael's. Enjoy the day and Happy Spring! See, told ya! SUPER simple! See ya back here next Sunday! Happy Belated St. Patrick's Day!! I love St. Patrick's Day and since my scheduled posting day wasn't until today, I didn't get to wish everyone a Happy St. Patty's Day!! So, I was looking over my dies from the Gnomes and Fairies release and trying to see if I could use any of them on a St. Patrick's Day card. 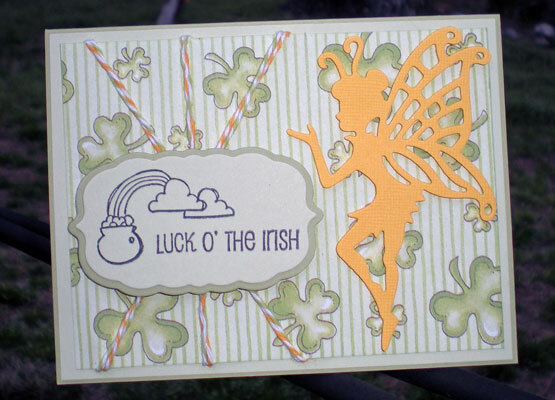 I decided to grab the Filigree Fairy because for one thing, I love her, but more importantly, I thought she would be perfect for sending a little Irish wish! 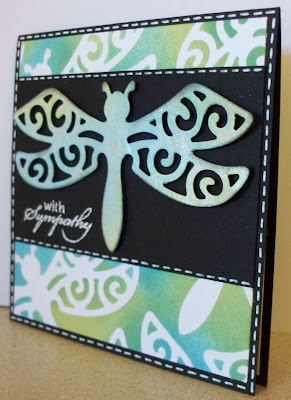 I also used the Cottage Cutz Frame Die to add my sentiment. 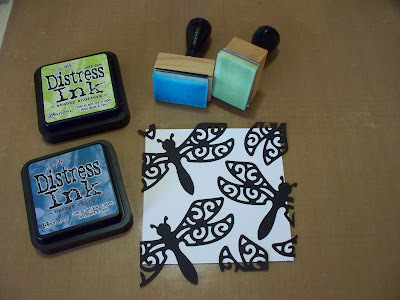 I still love the dies from the Love Notes Release!! So much versatility packed into one release!! That's all from me today! Check back tomorrow for another fabulous creation using your favorite Cottage Cutz dies. Until next week, happy scrapping!! Hello and happy Friday! 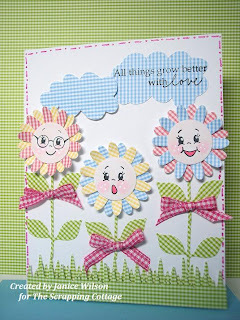 I have a card for you today that I made with a couple of the new dies from the Gnome/Fairy release at The Scrapping Cottage. I used Mr. Gnome and the Gnome Tree Stump House. I cut everything with white card stock and colored with my Copic markers. I thought it would be cute to have Mr. Gnome peeking from behind the house. I hear Gnomes are kinda shy like that. LOL!! Papers are mostly Bo Bunny, bling is all pink but the scanner always eats the color right off my bling for some reason. pocket, and hearts from the locket die. One of my favorite things about Spring is hearing the birds sing in the trees. 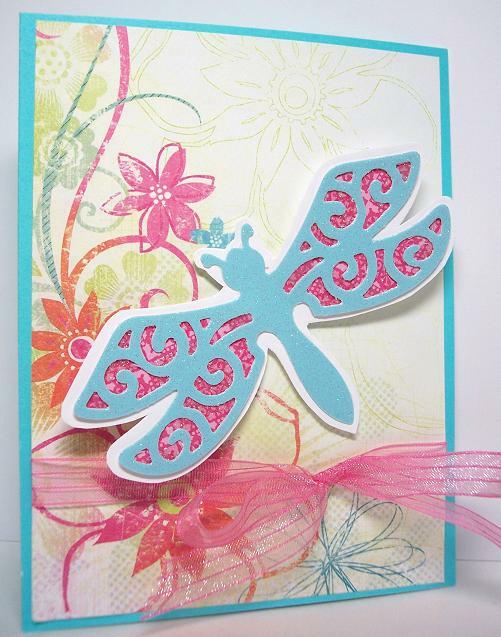 This CottageCutz Bluebird is from last years spring release, but I never had a chance to use it till now. 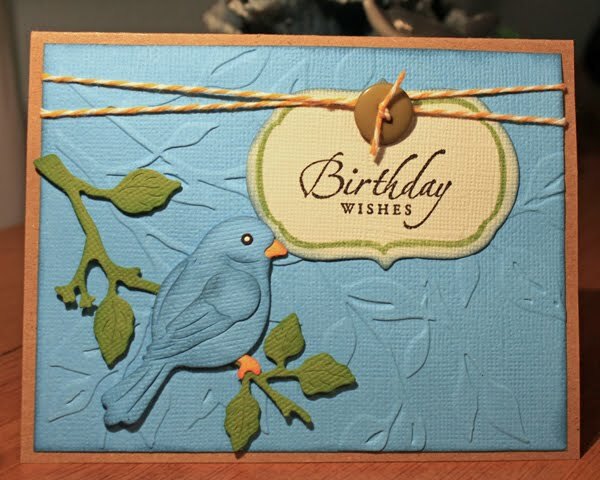 This went together so quickly and was perfect for my father-in-law who is an avid "birder". Here is hoping you hear the sounds of spring today. Have a great one! Have a Pixie Perfect Day! 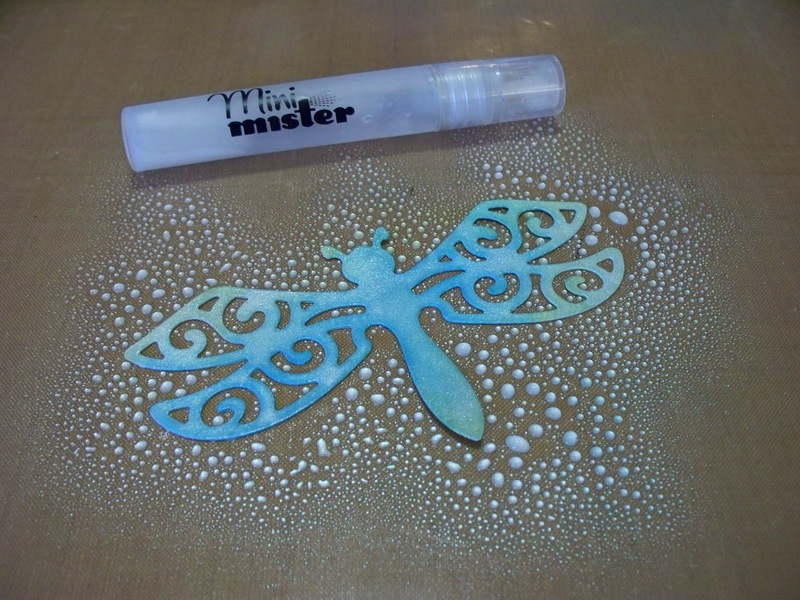 Gnomes, flowers and butterflies, oh my!